I'm still tired. Too tired to tweet. Too tired to watch the whole Real Housewives of Beverly Hills reunion show on my dvr. The kids are tired too. Tired from staying up late because of anxiety and excitement. Tired of looking for clothes and remembering new routines. Every time Lucy gets out of the car she still goes to the wrong house. 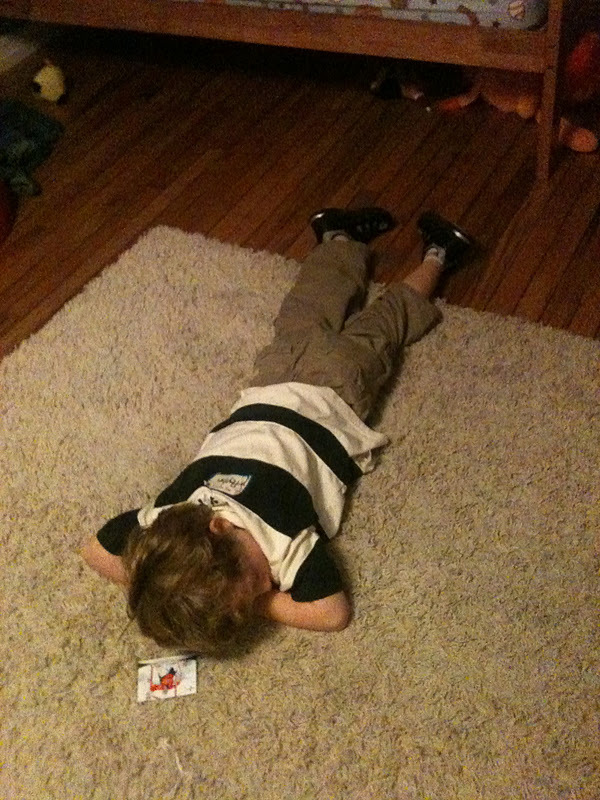 This was JT tonight after school, he fell asleep before dinner on his floor. And the saddest part was, I was jealous and wished I could fall asleep on the floor too. But there are other reasons I am tired. A friend died this week. She was battling cancer so it wasn't a surprise, but I am still in shock. There are so many things I am feeling. Grief is strange. This friend was a mentor, teacher, mother figure to me. We hadn't been as close the last year of her life and that fills me with, well, a lot of feelings. Grief is strange. One of my friend's favorite words was JOY. Here's a one of my favorite songs about being joyful. If you have a few minutes and you were a fan of Wonder Years, watch this. You'll probably remember this episode where Kevin's teacher dies. It's just five minutes of the episode, but my friend reminded me of the teacher (tough, but loving; and I was always looking for approval until I wasn't) and I again sadly relate so much to the naive seventh grade boy (ugh, but lol, see very mature with the lol, whatever).